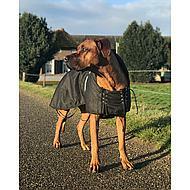 The Multiseason dog blanket with padding keeps your dog dry and warm in wind and weather. 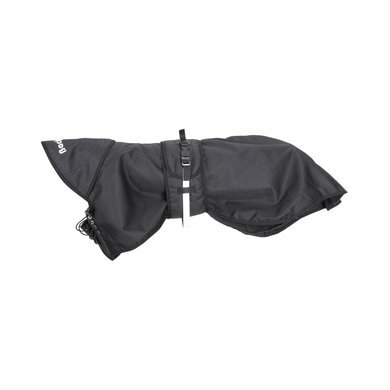 Durable rip stop outer fabric with sealed seams. The blanket has a wide chest / abdominal belt and a collar for optimal performance. Size adjustable at the chest and above the withers. Equipped with elastic leg straps and an opening for the belt. 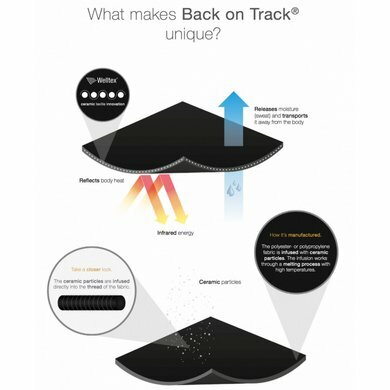 For extra safety, the blanket is equipped with reflectors on the sides. Super fine coats. At this time of the year my male with spondylosis has him every walk. Only downside is that they sometimes shift a bit despite the leg straps. An explanation that the belly flap does not close with Velcro would also be nice, a coat is therefore much too big for my dog but good. Furthermore, very satisfied. Very satisfied, our 14-year-old dog with osteoarthritis will certainly benefit from it with colder / guurder! Good fit, nice and smooth, does not get in the way. Amazingly sweet, warm, warm coat! Absolutely no bad quality but really value for money! Our koukleum dot friend is now having fun with us in the snow, ice and rain! 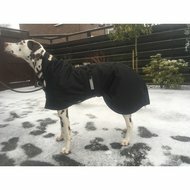 Question: What is the difference between the dog rain blanket with and without filling? Answer: A blanket with filling is warmer than a blanket without filling. Question: How do I take the right size? Answer: the sizes indicated on the website are back lengths. If you measure the back of your dog, you know which size you can order.